Can I export source and destination values from the AttributeValueMapper? I have a very long list of attributes that I have typed into an AttributeValueMapper transformer. I now want to share this mapping with someone (not an FME user), so I would like to export the source and destination values to excel. I see that there is a button to import to this transformer, but not one to export. Is there a way around this, or doing I have a lot of typing to do? Can you not just write out the source and desitination attributes to a csv after passing through a duplicate remover? If all the source values are present prior to going into the Valuemapper, you can, as Grommm suggested, write them out to txt\csv using the FileWriter. Sameway you can use filewriter to write destination vlaues after the Valuemapper. Of course it is somewhat more handy to create the ValueMap in a txt-file int he first place.. I dont think I was using all of the values so I ended up opening up the FMW in a text editor and did some find a replaces. Attached is a workspace (FME 2016.1.3+ required) that uses the workspace reader to export all the AttributeValueMapper settings of a specified workspace to a CSV file. The resulting CSV file has a column for the transformer name and the source and destination values. It should be handling international characters just fine (but do let me know if it doesn't). It should be fairly simple to extend so as to include the default values as well as the source and destination attribute names. @david_r, thanks for sharing the elegant Python script. To make it robuster, I would suggest modifying the script so that decoding will be performed after splitting the parameter by commas. Because, if a source or destination string value had a comma, it has been encoded as "<comma>" here and it can not be decoded before splitting. Good catch, I agree completely. Fixed. Next to the joiner another possibility to use the external mapping file is the SchemaMapper. I usually try to avoid the AttributeValueMapper as much as possible and just use it in 'throw away' workspaces. Copy the AttributeValueMapper in the workspace to the clipboard. The open a text editor (notepad or similar) and paste from the clipboard. This will give you the definition of the transformer (including a list of all values) in text format. This can be read (after a little editing) using the CSV reader. The attachment is an experimental workspace, which demonstrates a possible way to parse a workspace (*.fmw) with the FMW reader, extract source/destination values from AttributeValueMapper parameters setting, and decode them. The workspace you provided is excellent, thanks. That is, first create the Summary Annotation for AttributeValueMapper, and then copy the Annotion paste into the text editor. Cool! Could also be used for some other scenarios. I found that there is another way, directly open the workspace(*.fmv) with a text editor, Find the desired row by searching for a list value, and then copy the required content. The advantage of this method is not only can be applied to Transformer, can also be applied to user parameters, For example, get the values of choice type parameters etc. The disadvantage of the method is that unicode characters and some special characters within the AttributeValueMapper parameters have been encoded. e.g. I don't know an easy way to decode them, other than using FME predefined Tcl FME_DecodeText function. And this is exactly why you should use a Joiner, joining for example to CSV or Excel, instead of an AttributeValueMapper if you have a large number of values you want to map. Joiner no longer exists. There is now a DatabaseJoiner, but that cannot be used for joining to Excel or a CSV. What would you suggest using instead? FeatureMerger? Really? 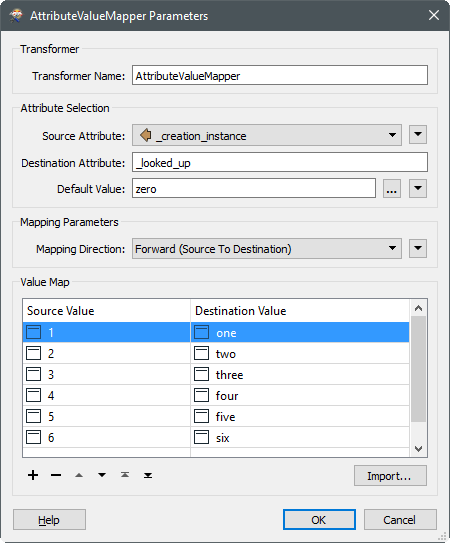 It seems to be planned that the Joiner will be upgraded and renamed to DatabaseJoiner in FME 2017, but I believe that the transformer still supports any tabular format such as CSV and Excel. Of course you can also use the FeatureMerger. I have this same problem, except I don't have a source dataset with all the values in it. Just inherited an AttributeValueMapper with a long list of Source and Destination values (about 300), and now have no way of getting them out of there. Any suggestions? Maybe @takashi knows? Hi @dmatranga, I don't think there is a way to export the mapping table from the AttributeValueMapper parameters setting to an external table, unfortunately. If you will have to maintain the mapping rule in the future, consider creating an external table manually and modifying the workflow so that the attribute mapping refers to the external table, as @erik_jan suggested.